Colored eggs for Easter; image by Annie Spratt, via unsplash.com. Looking back on the last two decades, the U.S. holiday retail sales statistic undoubtedly shows a steady rise in retail income. Even when it comes to e-commerce, no marketer is surprised to hear that Christmas, New Years, Thanksgiving and Black Friday online sales exceed expectations. What can a well-planned holiday marketing campaign offer your business or brand, and how to make the most of the dates your clients and customers cherish? Here is all you need to know before you start planning your holiday marketing strategy. Your brand stands to gain a lot from entering a holiday frenzy with an appropriate attitude. Here are a few most important advantages to keep an eye on. Holidays inspire and share positivity. A holiday is in many ways just like any other day of the year. What makes it truly special is a positive atmosphere, “a holiday cheer” that all people share. When your brand takes part in creating and spreading positive vibes, your business can only benefit in the process. If you hit the right note, the results of your holiday marketing efforts can resonate with your audience on a really deep emotional level. Coca-Cola holiday ads are probably the most successful example of this practice, showing that a well-planned, consistent holiday marketing strategy can leave a long-term positive mark on your brand. Holidays give you a chance to give a “soul” to your brand. Even if your brand voice is designed to reflect earnestness and reliability rather than inspire creating emotional connections, holidays will prove to be those wonderful times of a year when you can bend the rules a little. 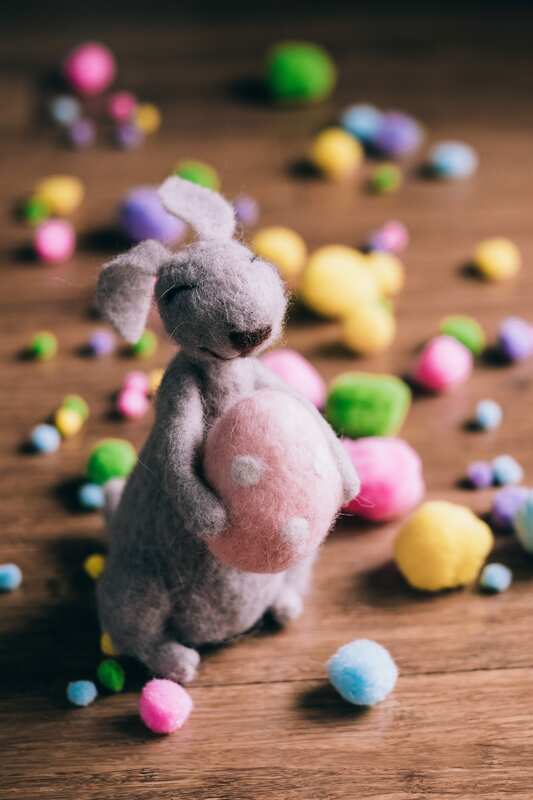 Stuffed rabbit holding a stuffed Easter egg surrounded by colored cotton balls; image by freestocks.org, via Unsplash.com. Let your audience see your brand as a friendly face, rather than just another company looking to make a sale. What can we learn from the successful Easter marketing campaigns created by famous brands? A little bit of humor, timely and appropriately used, can go a ling way. It is said that families that laugh together, stay together, and the same thing goes for brands and their audiences. During the holidays, people are already looking to make purchases, and they will rely on your advice and guidance in the process. Whether they’re shopping for themselves or for the people they care about, when the holidays are near, people are more likely to respond to ads and shopping suggestions. Let your customers know you care about their needs and wishes, and use the holiday cheer to connect with them on a deep, personal level. Holidays and social media: How to make it work? There is a single rule of marketing that doesn’t change, holiday season or not: To reach your audience and leave a lasting impact, you must go where your customers are. In this time and day, most of your customers are using social media during the buying process, and if you’re not there to actively participate and contribute, your brand is far from reaching its full potential. Here are several examples of how you can use social media to promote your brand, services, or products in a holiday season. Pay close attention to the written content. Holidays are a great time to share inspiring and educational stories, so make sure not to miss out on this opportunity to make your brand shine on social media. ResumesPlanet experienced contributors strongly suggest creating a well-thought-out content calendar in advance. This way, your marketing team will be able to generate and proofread every copy and each of the articles beforehand, leaving nothing to chance. Show that your brand cares about the customers by offering holiday-oriented discounts. Holiday is a time of giving and sharing, and your brand should be a part of it. Whether you decide to offer monthly, weekly, or limited-time discounts for specific products or services, your customers will surely appreciate the gesture. Provide relevant gift suggestions. Be creative in your approach, and let your customers know which products or services from your offer palette could be perfect gifts for the upcoming holidays. Sincere care and an imaginative copy can go a long way! Share your team’s holiday spirit. Does your team love to decorate the office, bring presents, or create an individual atmosphere for specific holidays? Sharing a glimpse of your office holiday spirit on social media will help your audience see the human side of your brand. It goes without saying that this move can bring your customers closer than ever before. Reward your loyal customers with special discounts and presents. This is the best way for a brand to show care, and your audience is sure to respond to such tokens of appreciation in the best possible way. Holidays are beautiful, fun, emotional times, but they can be stressful, as there is a lot to be done within a tight time frame, so make sure to start planning your campaigns on time. Have in mind that people will prefer honesty and relatability to any pitch-perfect ad your marketing team can come up with, and it’s not different when it comes to your holiday marketing strategy. If handled tastefully, even adding a little humor to the mix can be a step closer to your target audience. Reach out, make your brand seem like their friend, offer discounts and gifts, and spread the holiday cheer! Mark Delarika is a writer, entrepreneur, and a blogger with a background in teaching. He is focused on sharing his extensive experience in order to educate both students and businesses, especially when it comes to developing their writing skills, as a staff member for a cheap essay writing service EssayWritingLand.